Sockeye hasn't been to a semifinal game since 2015. PoNY makes their debut. They took very different roads to get here, but No. 2 seed Seattle Sockeye and No. 3 seed New York PoNY will meet in the semifinals on Saturday. While Sockeye convincingly held seed throughout the tournament, PoNY dropped a game in pool play and narrowly dodged an upset from Machine in the quarterfinals. PoNY’s results are more tarnished than Sockeye’s immaculate record this weekend, they had shown the ability to overcome adversity. To take a punch in the mouth and hit back. No one has touched Sockeye thus far, so it’s still to be seen how they will handle their first major roadblock. PoNY recovered from a shocking loss to Johnny Bravo by walloping Truck Stop to win the pool and responded to trailing Machine 7-3 by going on several multibreak runs to winning a thrilling game. Of course, when PoNY clicked, they looked better than anybody. They dismantled an excellent Truck Stop team in pool play with a precision and verve unmatched by any other team this weekend. The offense has weapons across the board, and Jimmy Mickle is probably the best ultimate player alive. When PoNY has thrown their full weight into a point, they have been overpowering. The probably is that it’s been a matter of when. Sockeye on the other hand has looked near flawless. They started the tournament on an electrifying note—Trent Dillon going full extension to reel in a huck from Dylan Freechild—and have channeled that strong current the rest of the weekend. Running varied offensive sets has kept their opponents guessing and Sockeye’s speedy cutter thrive in those split seconds of defensive indecision. Sockeye has spread the wealth, with no player scoring more than ten goals but five players with five or more. Their diverse sets, rotating seamlessly between a side stack, deep set ho stack and flex split stack, get backfield players going upfield and vice versa. It requires their O-line players to fill multiple rolls, but so far they have been up to the task. Dylan Freechild and Matt Rehder traded off going deep and coming under against Sub Zero, terrorizing Sub’s defense. PoNY should have enough pure speed on defense to contest Seattle, but whether they can handle the tactical challenge could be the deciding factor. It will be PoNY coach Bryan Jones’s biggest challenge of his career, coaching in his first ever semifinal. This will be Sockeye’s first semifinal since 2015, when they reached the championship game only to fall to Revolver. Since then they have only added talent to their core, but all that talent suffered disappointing performances at Nationals. This created a cloud over the team that may have led to an underappreciation of their roster this season. A big part of the knock on Sockeye was their purported mental weakness, but so far at Nationals they have shown nothing other than a team completely focused—perhaps even maniacally—on coming home with a title. PoNY have expressed a similar urgency, as its anyone’s guess what the team’s roster will look like next year. The stars aligned to pack their roster with Jimmy Mickle, Beau Kittredge, Ben Katz, and the rest of the team’s high profile pickups this season, and it seems likely that they will only have this one shot to win a championship together. In terms of personnel, PoNY present some obvious matchup problems in the form of Mickle and Chris Kocher. Sockeye has some long, rangy bodies they can throw at Mickle, maybe Zane Rankin or Matty Russell, and Trent Dillon could be a good fit for marking Kocher. The problem is that this drags some of Sockeye’s best offensive weapons onto the defensive treadmill of chasing Mickle and Kocher around all game. Sockeye may opt for a zone approach, as Machine were able to bother the PoNY offense by forcing them to throw lots of passes through a force middle zone. PoNY will likely try to run some switching schemes against Sockeye’s dynamic attack, and may opt to run waves of defenders at Freechild. PoNY’s standard defense has struggled a bit to garner breaks so far this weekend, and have needed to stack the D-line with offensive players to get the job done. How often PoNY opts to cross over those players could have a big impact on the game. 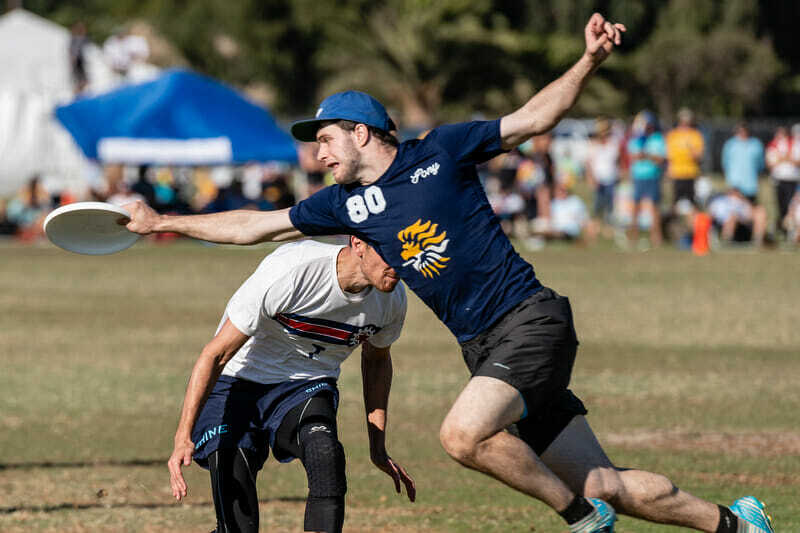 Despite having never been to semifinals in their history, PoNY boasts national championship experience with the Johnny Bravo players they have imported and Beau Kittredge. Sockeye, for all their history, have only a couple players who have gotten over the finish line. Semis isn’t the championship, and a tough game against either Revolver or Ring awaits, but it seems that this game will expose which of these teams is the complete package and which one has been a mere pretender. Comments on "Redemption Vs. Ascension: Sockeye And PoNY Face Off In Semifinal"